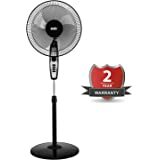 Amazon's Choice for "pedestal fans for home"
Sold by Cloudtail India (4.5 out of 5 | 73,045 ratings) and Fulfilled by Amazon. Gift-wrap available. Motor over heat auto protection. Aerodynamically designed semi- transparent blade. High air delivery. 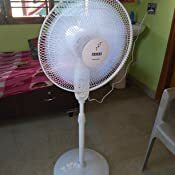 Powerful motor designed for Indian weather conditions. Unique pivot arrangement for uniform oscillation and tilting. Sweep Size: 400mm. 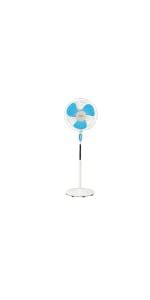 With USHA Maxx Air Pedestal Fan, you’ll be comfortable in any weather, anywhere. 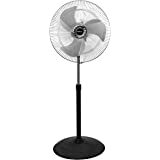 Be it your veranda, garden or indoors, the elegant and stylish looking pedestal fan eliminates all discomfort, thereby energizing your body. And with two color option – White and Blue, it complements your home or office interiors perfectly! Cool air stays at a lower level of a room. 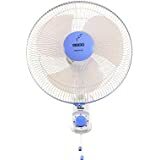 These portable floor fans throw the cool air horizontally, thus circulating it to provide instant relief and comfort without disturbing the hot air accumulated at the ceiling. 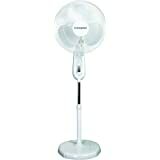 The spread of cool air is further enhanced by the wide throw and oscillation angles of USHA Maxx Air Pedestal Fans. 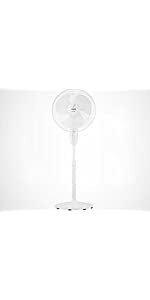 Plus, flexible tilt-back feature and height adjusting mechanism are designed ergonomically to customize the position of the USHA pedestal fan to suit your need. 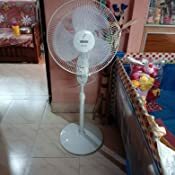 USHA Maxx Air Pedestal Fan is driven by high quality, reliable and best in class motors with aerodynamically designed blades that maximize the effectiveness of air conditioners by generating a comfortable breeze, thereby enabling you to save energy by increasing thermostat temperature setting. 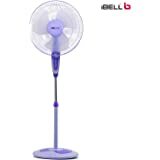 So, while you enjoy cool comfort, you also save on huge electricity bills! 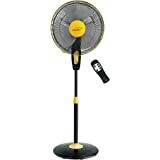 I purchased this fan after some good research and it turned out to be a good purchase. The fan was delivered nicely packed in a small carton. The packing was originally from Usha. 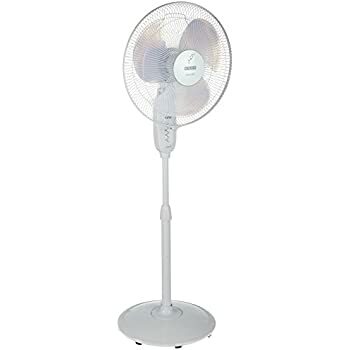 The white color of the fan is really nice. The installation was a 5-minute task. 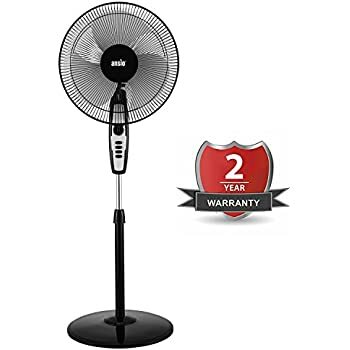 When you fit the rod to the base, take care of the slight notch on the base and aligned it properly with the rod else the fan will not stand correctly. Rest is all easy stuff. The base is heavy and all the components are well built. There should have been wheels on the base for easy movement. 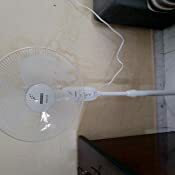 The fan's speed is not very high but the air throw is good. You can use it within a distance of 6 to 8 feet. The fan is a quiet one and won't disturb your sleep. A ggod product from Usha. 3.0 out of 5 starsJUST So So. Pros: Light weight, Good appearance, Silent Operation, Easy to assemble. Cons: 1450 rpm only; Moulded Plastic Blade; No wheels; China made. 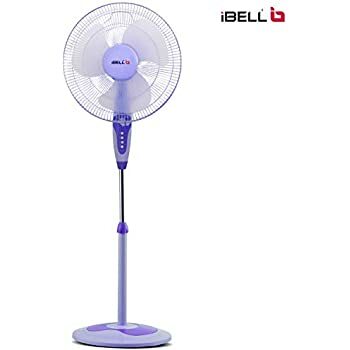 Conclusion: It would be better to spend a few hundred more and buy a heavier, india made fan with wheels and 2350 rpm. 4.0 out of 5 starsUsha care is phatetic. Not opting for any Usha products going forward. Product is good. Rotation angle could have been wider. The service from both Usha and their authorised service provider in my region is pathetic. The guy who spoke to me on phone from Usha care and also the person from local service provider were very rude. They didn't provide the requested service even after me following up with them for about 10 days. Not buying any products from Usha going forward. I don't see it worth on investing on something, how much good the product is, if there's no customer support / service after investing. 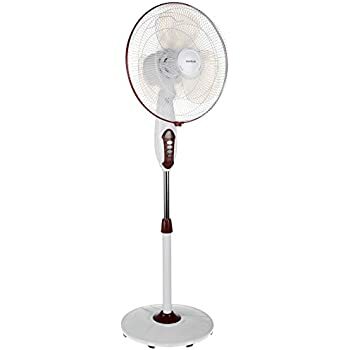 Speed is low compared to other high-speed stand fans. The blades are made of plastic and it takes the dust easily and become dirty soon. Not suitable in peak summer season. 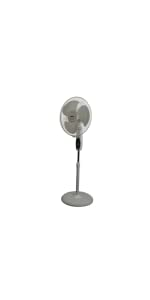 Perfect to use in a room where an air conditioner is available. Lightweight and easy to assemble. 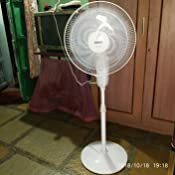 If you are looking for a high-speed fan, don't go for it.